Cotton Kiwi: Just a word of warning. Just so you know; if you happen to pop around to my house this week, you will be required to drink at least one bottle of fizzy fruit juice. This is so I can use the empty bottle for the soon to be four year old's birthday party. This won't be too much of a hardship I assure you. It's quite tasty fizzy stuff. Not quite the standard of the fizzy stuff with the exploding cork of course, but I'm happy to add a dash of vodka should you need it. Come to think of it, should the Birthday Girl receive any more birthday cards that sing Happy Birthday over and over and over and over again ....... I might add a dash of vodka myself. And some of you (yes I know you are out there because one of you is Mr Cotton Kiwi), may question my sanity over emptying soda bottles for the sake of filling them up again. But, I'm a crafter so it is in the job description to do things in a very convoluted and slightly crazy way in order to get them exactly how I want them. And besides, they will look pretty. 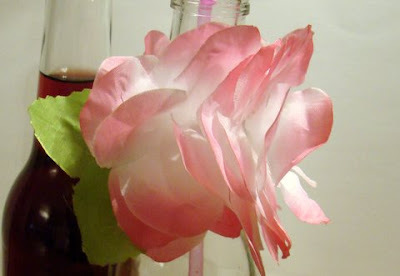 I saw something similar to these in the latest Kids issue of the Donna Hay magazine and thought it was just the thing for a flower fairy party. So if you are, like me, imagining how gorgeous these are going to look on the party table, I shall tell you what to do. Simply grab a packet of pipecleaners and a Hawaiian Lei flower garland (makes about 10). Cut your pipecleaners so they fit loosely around the top of your bottle neck. Dismantle the lei and make the holes in the centre of the flowers slightly larger (I stacked about 6 flowers together and folded them in quarters and then cut the pointy bit off). Thread about 10 of them onto your pipecleaner, including a leaf and then close the ends by twisting them. 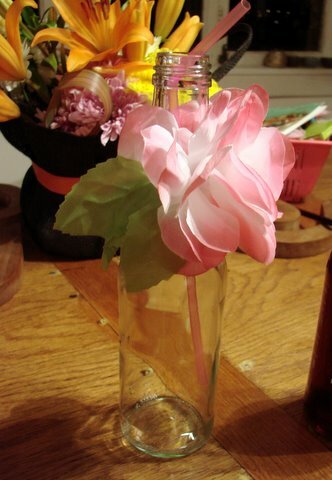 Cut off any sharp bits, spread the flowers out and drape artistically over your bottle. 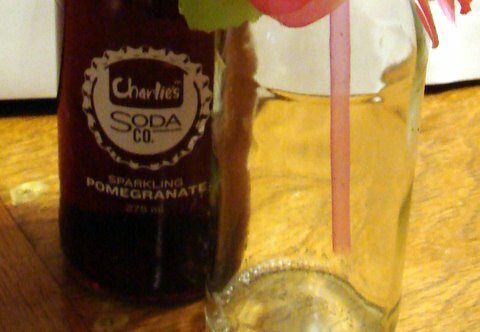 I shall be filling my bottles with pink lemonade (raspberry cordial and lemonade) and pink straws. And I shall have a large cloth handy to mop up the numerous spills that will inevitably occur. Ok then. I will agree that I am probably quite mad having drinks like these at a 4 year old's party. But they are going to look so pretty!!! What a great idea, they will look gorgeous! Oh, I love all the effort. They will look gorgeous! I look taking the long way to do something! It just shows how much you love the birthday girl. you are sooo NOT crazy! I think we have all been reading a bit too much Donna Hay! I have been collecting bottles for ages too. I don't think you're crazy at all! They will look great. Great idea! They will look so pretty and girly.